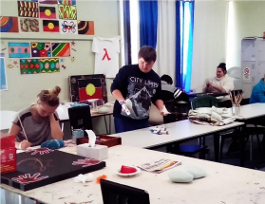 Eagle Arts represents a new approach to high school education in Broken Hill. Catering to students aged 14 to 20 years of age Eagle Arts offers individually paced learning programs in a relaxed social atmosphere that caters to and respects individuals. ‘Gathering Bush Food’ is a series of Aboriginal Art works depicting the gathering of Bush TUCKER. All works are on canvas with acrylic paint and have been painted by students and teachers from EAGLE ARTS and Vocational College in Broken Hill. The ages of the students are from age 13 to age 19. Derrick Lindh is the Aboriginal Art Teacher at the college with thirty years’ experience teaching art.